Here is Sigung Clear’s response to Phil’s essay on sensitivity. Phil’s original article is in italics and indented. Like this. Sigung Clear’s responses are bold. Like this. b. degree of susceptibility to stimulation. Electricity – The ability of a radio device to react to incoming signals, expressed as the minimum input signal required to produce a specified output signal with a given noise level. This has several interesting interpretations when applied to the martial arts. In martial terms sensitivity (“listening” or Ting jing) may be defined as the skill or ability of perceiving an opponents intention through a heightened state of tactile sensitivity using the whole body. In martial arts and particularly in Tai Chi the specified output signal is a trained response or responses that can be applied when desired and as necessary in the amount desired. In a living organism (in this case a human being) the variability is increased quite a bit in order to deliberately hide the response from the opponent until it is to late for them to counter and also to be careful to not fall into a trap that a skillful opponent may have set or be setting. It is also important to realize that the opponent may change at any time in order to spring a trap or as a direct result of sensing what you are doing and then responding to it. One of the benefits of being alive is that we can continually fine tune our sensitivity so that we can feel more and deeper with less and less input from the sender. 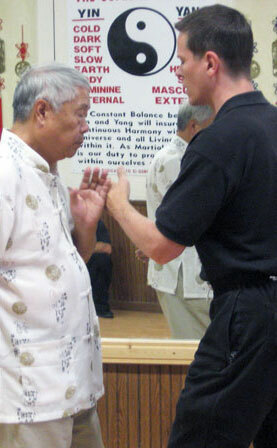 The traditional method of developing sensitivity is the practice of push hands. which is generally seen as the bridge to developing self-defense skills. To effectively sense or capture the opponent’s center of gravity immediately upon contact is the primary goal in push hands. Its self-defense strategy is to allow your opponent to come in and make contact with you so you can “sense” or “listen” and thus control, deflect and lead/entice their power/body into a disadvantageous position (lead into emptiness). Learn to feel or capture isolated or systemic tension in the opponent and use that tension to control or move the opponent thereby leading them into emptiness. Find the opponents source of power and cut it off or move it including surrounding it so that only emptiness can be perceived by the opponent. Feel the opponents mind intent and block it, disperse it or mislead it. This sensitivity needed to capture the centre is acquired over thousands of hours of slow, repetitive, exercise and then later adding more “realistic,” , fast, martial training; forms, pushing hands and sparring. I have found that the best way to develop real sensitivity is to work on building sensitivity by sensing and feeling while both receiving and giving but not in a set pattern. In the beginning this must be done very slowly so that the student has time to interpret what they are feeling. Most people want to go way to fast too early and miss building the sensitivity skill to anything beyond a very basic level and then wonder why they can not perform the master level feats. So, first sense or listen with your body and mind, then feel, then interpret and then work on various responses of all different kinds and then learn to do the same thing with less physical effort, better positioning with your energy and your mind. All of this should be done exceptionally slow and without much exertion until you have mastered it to such a degree that speeding up is the next obvious step. Then, you will find that speeding up while maintaining the skillful work is not very difficult. This is the Tai Chi way. The other aspect of this skill is sensing inside your own body. Truly deep softness is a skill that requires the practitioner to feel when they are using physical force and using or holding tension. To do this you must feel inside your own body and be able to release, relax and let go. All while still achieving an end result. No small order but this is definitely a skill that can be developed to a high level. The softer you are the easier it is to feel and neutralize an opponent. The trick is to NOT collapse but to relax and get soft while your structure is correct and stable and your energy is in the correct alignment and malleable as your will sees fit. Anyone correctly working at this level understands why and how the mental aspect of all of this is so extremely important to the point of being at least 90% of what is going on. The work can be physically and mentally tiring and difficult. Mental strength is the key to overcoming these obstacles as well. Some modern masters believe this progressive push hands approach is unnecessary and has been abandoned completely in favor of a more geometrical system that uses principle derived techniques as its foundational framework. I have found that the senior masters have trained the way that I have described in this article and that if they are not teaching this method then none of their students have anything remotely near the kind of high level ability that the teacher has unless the student is quite an exceptionally extremely gifted and lucky individual. Regardless of which approach is used, sensitivity or listening is developed by following two key principles. The first is to relax, sink, dissolve all tensions and simply let go. The second is to follow your opponent. I agree with the above and add that here this point: There are a lot of different exercises and ways to think, practice and play to properly accomplish the ability to really sense and interpret. For example, to follow your opponent feel inside them and feel where the energy wants to go and how deeply are they connected. If they are only connected to the level of pushing with their shoulder then perhaps the rest of their body and energy is moving away in response to their own tension. Learn to feel that split in the opponent’s internal intention and where the energy is and is not and where it is going and you will begin to see where the real training starts. You must be relaxed, sunk and without tension in order to do this with any real ability or skill. The idea is to make this second nature. All of my intermediate students can do this and my senior students can feel the separation and tension or split in an opponents energy without having to make physical contact with the opponent. The manner in which you develop listening energy is expressed in the Tai Chi classics. Developing sensitivity is therefore a crucial building block for the improvement of interpreting (understanding) and neutralizing skills in any of the internal arts. I understand what is meant by “isolated” tension, but could you please clarify what is meant by “Systemic” tension?